The way America communicates with each other and the rest of the world has in the past met with significant challenges from earlier beginnings of the printing press which issued a record number of propaganda to England on grievous matters; as well as, gathering together those minds who think expressively alike on issues of the heart. “Publick Occurrences, Both Foreign and Domestic,” America’s first newspaper was the vehicle to get that done. Brown says, “Publick Occurrences was brought to an end after only one issue by an outraged administration, claiming that it contained “reflections of a very high order.” It was printed without authority. An aroused bureaucracy issued a broadside warning against future publications of any kind without “licence [sic] first obtained from those appointed by the Government to grant the same.” (Brown, n.d.). America has most certainly come a long way from nothing to say to have much to say about everything. People of the world speak out about the happenings in life around them. Notably so, are those in charge of citizenry; such as the President of the United States where the most remarkable speeches come from those men who want people to live in harmony. 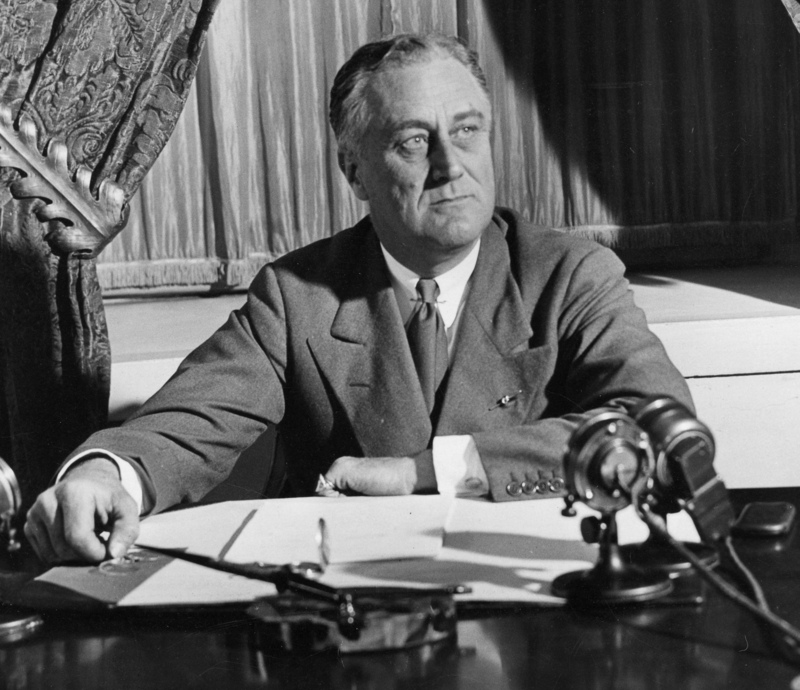 President Franklin Delano Roosevelt, whose “fireside chats” via radio changed American politics. He talked to American citizens about the “New Deal” and America citizens listened. (Eisenhower, n.d. Para. 2). American citizens read, they speak out and they watch. Most noted in America is the assassination of President John F. Kennedy where America sit in front of their television sets in horror and shock, and where one reporter notes, “In the new world of communications there was no time for any such babying of the emotions, no time to collect oneself, no time for anything except to sit transfixed before the set and try to bring into reality this monstrous, unthinkable thing. Because the word was not only instantaneous but visual, and because at no time did the television reporters know any more than the viewers did, 180,000,000 were forced to live the experience not just hour to hour, or minute to minute, but quite literally from second to second, even as the reporters themselves did. According to Nielsen statistics, a point was reached during the funeral on Monday afternoon when 41,553,000 sets were in use, believed to be an all-time high. For four days the American people were virtual prisoners of an electronic box.” (TV Guide, 1964, Para. 2). Accordingly, the internet is the world’s breakthrough of the silent citizen held prisoner to the radio, television and newspapers of their countries, because online there is radio, TV, newspaper all rolled into one huge global delivery system. No longer does the world have to sit fixed in front of the radio waiting for a broadcast; nor do they have to wait for the Sunday edition to get more of the news. Thus, the internet brings audio, video, news reporting and writing; and, what the citizens want right to the reader from anywhere in the world. The audience of the World Wide Web is endless and it has a personality to match. People from all walks of life log on to the internet wherever they are to read the news, play games, and watch videos, read obituaries and to visit their favorite sites. Rich and poor alike are in it for the ease and comfort of browsing from site to site. Hence, those who read online; especially news, are looking for instant news to fit their busy lifestyles. Gone are the days when people sit on the couch and wait for the news at 5 broadcasts. Life on the run is the name of the game and the internet meets those needs. Craig says, “In the United States the content of commercial media is generally driven by a combination of the medium’s own characteristics and the likes and dislikes of its audience.” (Craig, 2005, p. 9). Thus, there is something to fit everyone’s taste; from science to how-to guides. The online world of Journalism is far above that of the television in that there are constant updates available for any viewer who chooses to watch or read. Television is great for live broadcast but fails to give minute coverage and updates as is seen with the online news broadcast. Moreover, video clips can be viewed later if the reader has another obligation. It must be noted; however, with the Kennedy assassination viewers sitting riveted to screen also conveys the reality that those at work could not watch. TV Guide reports, “Walter Cronkite, the anchor man of the CBS team, was the first on the air with the bulletin. At 1:30 (EST) when the soap opera, “As the World Turns,” went on live, Cronkite was preparing his regular evening news show, and in every sense the day was an ordinary one, at least judging by the trials and tribulations of the characters in the soap opera. In retrospect, the hero’s sudsy dilemma as to whether or not he should remarry his divorced wife, and his mother’s subsequent conversation with his grandfather about it, seems about as eerily remote as another galaxy. Actress Helen Wagner was just saying, “I gave it a great deal of thought, Grandpa,” when the program was interrupted.” (TV Guide, 1964, Para. 8). Online activity and reader view allows for anytime view of the news no matter where; however, to be online one must have a computer. Craig says, “Reading online requires both a computer and internet access. A majority of Americans now have access to computers at home, at work or in the community, but this still weighs on the online audience heavily in favor of those who have computers. When compared with television, which is in more than 98 percent of U.S. households this is a seriously limiting factor.” (Craig, 2005, p. 8). Live news is always a plus, because no one can dispute whether a source is correct; and neither, does anyone question who said what. Hence, in news reporting the journalist citing sources correctly is critical in the interviewing process. The thing to remember and this is a key point; is that, sources are people with feelings and desires. No one likes reporters for obvious reasons; such as, people are mobbed by them, chased, by them, misquoted by them; also for a number of other reasons.Accordingly, rumors spread across America at the time of Princess Diana’s death where the media was accused of chasing her limousine which resulted in the crash which ended her life. Furthermore, no one has confirmed for sure whether or not this is true to this day. However, this is one reason why when interviewing there should be some kind of resolve on behalf of the reporter to get the words of the source right from the horse’s mouth; preferably, an eye witness. Craig says, “Local reporters are often recognizable figures who can be identified and engaged in conversation on the street and in the grocery store.” (Craig, 2005, p. 65). A reporter seen as friendly, and one who mingles with the people cannot be viewed as the “evil reporter” who sits behind their desk at the newspaper, nor, as one whose only care is to sell papers; but, can also be viewed as one who knows what the people want. The question every reporter should ask themselves is how I can help if I do not know what the people need? Speculating what the people want does not make for a good story. Another key point Craig brings out is “who is the person?” Hence, who is contacting the reporter to give information? Reporters, especially online should be careful to find out. Craig reflects on this when he says, “Does this person have an ax to grind? This is a particular type of ulterior motive. If someone is trying to promote a particular agenda within the company or institution, he is quite likely to slant the information he gives you. This can include trying to make a person look bad, trying to get good press for a possible course of action or helping a crony get good press.” (Craig, 2005, p. 66). The role of the journalist should be as trustworthy as the source, and because of advances via satellite interviews can now be shown live on the web; as well as via television. Technology has indeed come a long way. President Dwight Eisenhower, affectionately known as Ike was a man who loved the camera, as one journalist notes, “Due to new technological advances, including an improved transatlantic cable, his travels were seen by American audiences. Every night, living rooms in the United States were lit up with images of crowds cheering Eisenhower in England, Scotland, France, West Germany, Italy, Turkey, Greece, Afghanistan, Pakistan, and India. The broadcasts permitted the public to relate directly to the international enthusiasm for Eisenhower, something that was much more difficult to experience by reading news accounts in print. Ike’s travels and TV appearances were so successful that he was named “Man of the Year” in the January 1960 issue of Time. The American public seemed to care less about the mistakes Ike made in the press conferences than they did about the repeated efforts he made to keep them personally informed about the national and international challenges the country was facing in the 1950s. Interestingly, no president since Eisenhower has convened as many broadcasted press conferences.” (Eisenhower, n.d. Para.10). Broadcast of these travels are a notable accomplishment for the time; however, times have brought rapid growth and change of news reporting and styles. The internet is that change. In remembrance of the first newspaper which was scrapped after only one issue. Many of the old British set would most probably turn in their graves to see, hear, and read what their kinsmen are writing today. Further, they would most likely be surprised with the measures on which they are getting it done. Way New Journalism has introduced a packaged deal, and Quittner writes, “Imagine what those new journalists could have done with video and sound, with hypertext, and limitless bandwidth.” (Quittner, 1995) (As cited by Craig, 2005, p. 93). Older people are still enthusiastic about the newspaper. There is no technical savvy or know how needed to turn the pages of papers, or linger over a cup of coffee with the morning edition. However, most adults in the work world; especially journalist have made great use of the their time spent reading and gathering stories for those readers who either do not have time for the traditional read, or who just don’t want the bother. Craig says, “The style that emerged had less to do with traditional straight ahead story telling than grabbing the readers and shaking them to attention. It would be witty, irreverent and challenge the reader rather than simply stating facts.” (Craig, 2005, p. 93). Citizens are becoming increasingly involved in journalism. Traditional journalism, such as is found in print with its fact and data is still valued. However, who tell can tell what goes on in their neighborhood better than those who live there? Hence, straight from the horse’s mouth is really being explained here. Glaser says this, “The idea behind citizen journalism is that people without professional journalism training can use the tools of modern technology and the global distribution of the Internet to create, augment or fact-check media on their own or in collaboration with others. For example, you might write about a city council meeting on your blog or in an online forum. Or you could fact-check a newspaper article from the mainstream media and point out factual errors or bias on your blog. Or you might snap a digital photo of a newsworthy event happening in your town and post it online. Or you might videotape a similar event and post it on a site such as YouTube.” (Glaser, 2006, Para. 1). People are not taking the media’s word for it anymore, and some even take it a step further to report the news again on the same stories seen in the media. It is not the case that the journalists’ report the news and the people accept what they read as truth. People today; ordinary people, who work, and live near by are reporting the news as they see it. Craig adds further, “Most online news stills bears a strong resemblance to print news, with a few bells and whistles sprinkled in to add a little spice. However, it seems that online news has begun to develop a voice and a style of its own, based largely on characteristics of the medium…any fool can cop and attitude, but the best writing in the “New Way” style often contains solid, factual reporting behind the humor and irreverence.” (Craig, 2005, p. 98). However great, journalism on the internet has become in reporting the news; whether print or broadcast through television or radio the news gathering and sources should be reliable. Journalists must be considerate of laws as well as adhering to them. Many people have found themselves in court responsible for not only their words, but the action of others. Hence, legal issues are always a concern for the journalist whether on the internet or other vehicles of reporting. Concerning Participatory Journalism We Media says this: “The venerable profession of journalism finds itself at a rare moment in history where, for the first time, its hegemony as gatekeeper of the news is threatened by not just new technology and competitors but, potentially, by the audience it serves. Armed with easy-to-use Web publishing tools, always-on connections and increasingly powerful mobile devices, the online audience has the means to become an active participant in the creation and dissemination of news and information.” (Media Center, 2012, Para. 16). Participants from every walk of life want to have their say and news sites all over the world are giving place for them to say it over the internet. We Media adds, “According to the Pew Internet Project, the terrorist attacks of Sept. 11, 2001, generated the most traffic to traditional news sites in the history of the Web. Many large news sites buckled under the immense demand and people turned to e-mail, weblogs and forums “as conduits for information, commentary, and action related to 9/11 events.” The response on the Internet gave rise to a new proliferation of “do-it-yourself journalism.” Everything from eyewitness accounts and photo galleries to commentary and personal storytelling emerged to help people collectively grasp the confusion, anger and loss felt in the wake of the tragedy. (Media Center, 2012, Para. 17). Hence, everybody everywhere can be a reporter and tell what they see, think and hear about news happening all over the world. This breakthrough for the everyday person brings with it many challenges to site owners who want to allow the citizen to have their say, but must be aware of damages and legal issues which can arise if they fail to monitor their guests. One person found this out first hand when he found himself on other end of a court citation. “Stratton Oakmont v. Prodigy (1995). In this case, claims were made that an anonymous Prodigy user posted defamatory remarks about Stratton Oakmont in their Money Talk forum. In this case a person might ask; why does this make the site owner responsible for their participants’ remarks? The premise here is simple, the owner of the site is responsible for the remarks of those who post if they maintain editorial control and the right to delete defamatory or argumentative posts and content on their site. (as cited by Craig, 2005, p. 239). Thus, site owners should be careful of their responsibilities in the content allowed on their site. Craig adds, “The internet has operated for more than 30 years, yet legal status of much internet communication is still largely unclear for three reasons: The first is that it’s truly an international network, with no central headquarters in one nation and no organizing authority. Secondly, it has radically changed the nature of intellectual property. Thirdly, the explosion of the web in the last few years has brought an exponential growth of commerce to the Web, with all its accompanying legal issues. Each of these has implications for the journalists.” (Craig, 2005, p. 233). Therefore, the journalist and site owner should be aware of these implications. Journalists have some protection through shield laws which protects them from having to divulge sources; this however, is true for some states but not all. Publick Occurrences, Both foreign and Domestick. This entry was posted in Culture, Education, Family, Home, Internet, Journalism, Opinion, Professional Blog and tagged American, CBS, Helen Wagner, Para, United States, Walter Cronkite, World Turns, World Wide Web. Bookmark the permalink.